Many music fans should be familiar with Louis Prima from his days performing with his wife Keely Smith. Most of their hits were on Capitol Records in the 50s. The biggest hit was probably That Old Black Magic. The duo's stage antics and the jazz background of Sal Butera and the Headhunters was a big draw in Las Vegas. The end came when Keely filed for divorce in 1962. Prima tried to replace Keely with 21 year old waitress Gia Malone. That didn't turn out very well but they did marry and had a son Louis Prima Jr. Prima was not getting bookings so it looked like his career was over. Fortunately, he got involved with Walt Disney. Disney was casting for the 1967 film Jungle Book which was Disney's final production before his death. He met comedian Phil Harris at a party and Harris was cast as Baloo. Disneyland Records president Jimmy Johnson suggested that Louis Prima as King Louie would be a good foil for Harris. The film was a big success. Prima performed I Wanna Be Like You and he recorded two albums with Harris. Disney had planned to produce The Rescuers in 1962. That didn't work out but Don Bluth revived it in the early 70s. The original plan was for Prima to play Louis The Bear and sing several songs. Robin Hood songwriter Floyd Huddleston wrote three songs for Prima including Peopleitis and Prima recorded the songs so the artists could get to work. The songs and character were supposed to remind us of Prima's performance in Jungle Book. The studio proceeded with pencil tests and storyboards. Unfortunately, Prima got very ill in 1975 which led to his 1978 death. Bluth decided to continue the film without Louis The Bear and the songs weren't used either. 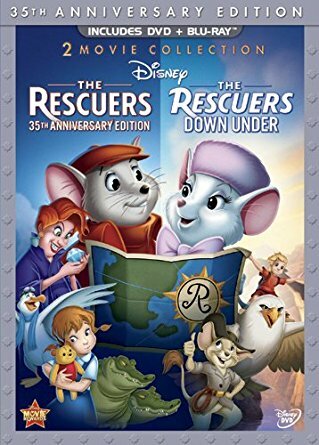 So these songs sat in the Disney vault all these years until Disney decided to release a 35th anniversary DVD with The Rescuers and the 1990 sequel The Rescuers Down Under in 2012. One of the extras is a video for Peopleitis using the Louis The Bear pencil tests and storyboards. You can also get the lost songs on The Lost Chords: The Rescuers. That was released only on mp3. I recommend either to Disney fanatics. It's not for casual fans though it is an interesting story. Here's the video for Peopleitis by Louis Prima from The Rescuers 35th Anniversary Edition. Thanks to A Lost Film for the story.